We all love technology and I am happy as the technology development makes our life better. However, we should be aware of its downside as well. Nowadays, people become busier, they stick with their gadgets all day and even don’t have time to exercise. Many of us have to work 8 hours daily in the office, then we go home, relax on our comfortable and watch TV, use laptop, or playing with smartphone and tablets. If you are living your life this way, you are killing yourself. Human is not designed to sit. We are not designed to sit for a long period of time. As we are spending even more time sitting than sleeping, it could lead to serous damage to your health. You could suffer obesity, diabetes, heart disease, or disc degeneration and herniated discs that would cause low back pains. As we sit, our blood couldn’t be circulated and muscles also won’t work synergistically to support the spine. Our body is designed to be upright and we must work out for our own health. Many people are aware of the risk but they can’t change. It is not totally their fault but it is our job’s requirements. We have to stick with our computer or laptop and it is very difficult to get away each 30 minutes to exercise. I tried it and failed simply because we can’t keep our mind fresh and ideas flowing when being interrupted. I was looking for some solutions for myself and I found a very interesting product from FitDesk. 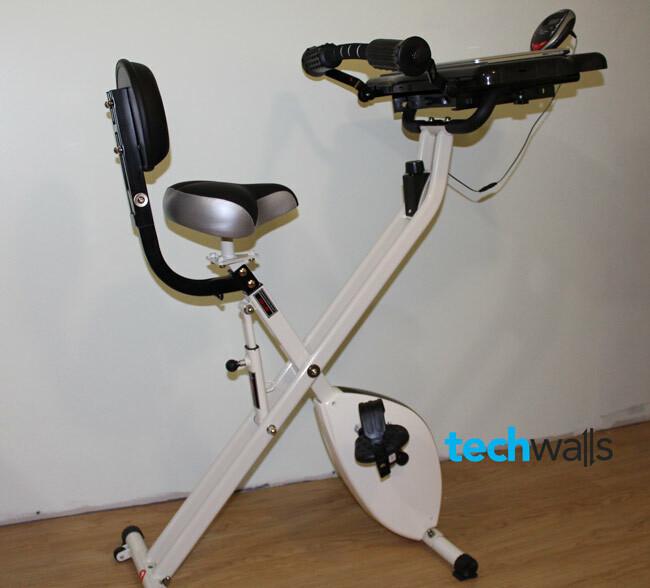 They sent me the newest FitDesk v2.0 Desk Exercise Bike and I’m so glad that I could write the comprehensive review. 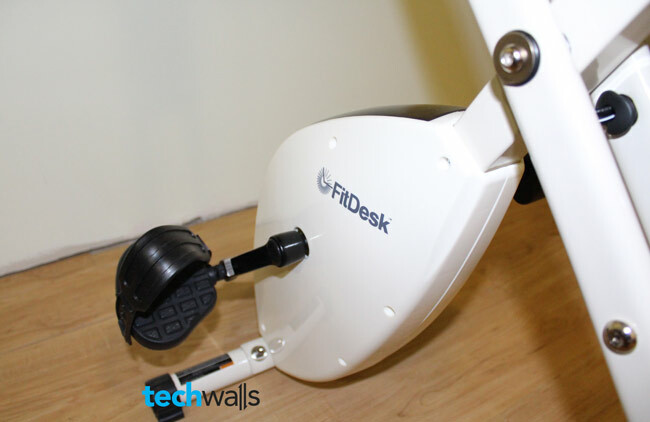 If you are looking for a trustworthy review of the FitDesk bike, probably you wouldn’t discover any. I tried searching on Google and most results leading to landing pages of internet marketers who are trying to sell the product through their links. It is not a big problem but they are recommending without trying the product. Therefore, you won’t find any useful information on those websites. 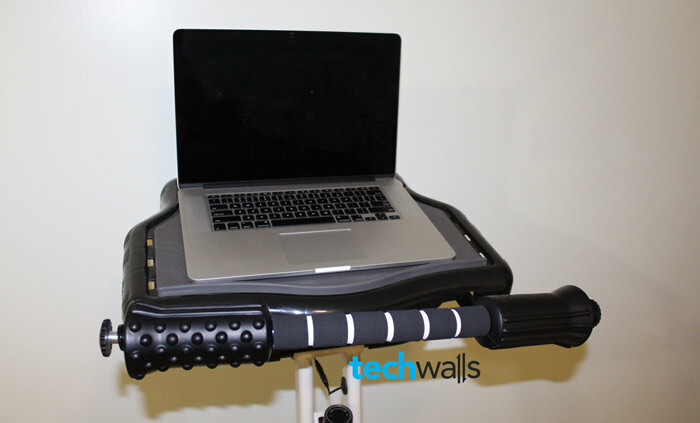 Let’s check out our review to see if the FitDesk v2.0 could improve our health while working. Take a look at some images of the product. 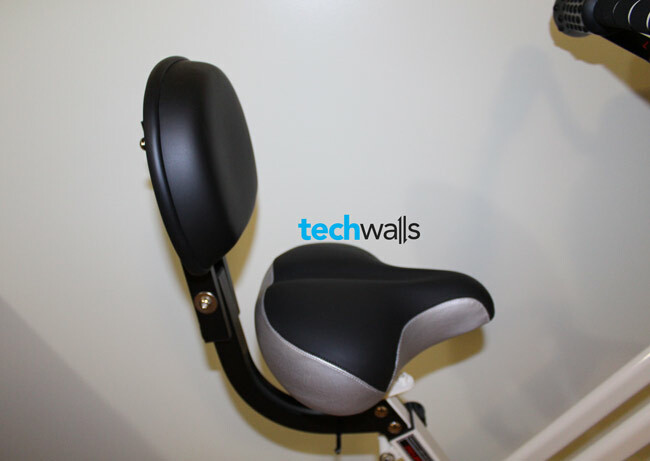 The saddle is big and quite comfortable with a leaning back. It is also adjustable with a 4-inch extender. The bike also comes with a resistance band to help build upper body strength. 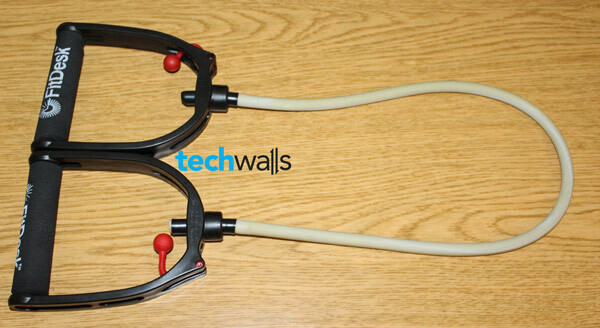 It is very lightweight and made of high-quality rubber material. The main engine of the exercise bike – a twin belt, high velocity flywheel, is super quite when I’m pedaling. You can check out the video I recorded below. I used some exercise bikes before but I hate most of them because of the noises they produced. So, I am very impressed with the flywheel because it won’t cause distractions and I could concentrate on my work. This is how I place my MacBook Pro with 15.4-inch screen on the desk. It fits perfectly but there is not enough space to use your mouse. I could pedal while working (although it could take a few days to get used to it). The soft rubber on top of desk could keep my laptop very well. I even don’t need to use the provided strap. The massage bar is quite comfortable for your arm. I hear clicking noises sometimes. The wire connecting to meter can’t be attached to the desk. The desk is a little small for big laptops as there is no space for mouse. The saddle is not comfortable enough to sit for a long time (I can sit in around 1 hour). 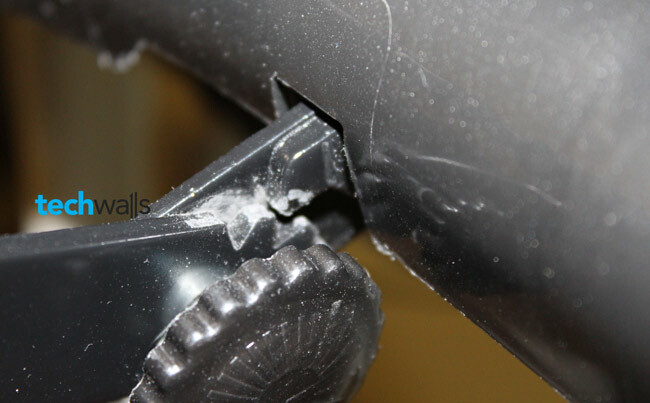 The massage bar is not sturdy and can drop to lower heights any time. This seems to be a design flaw as the right side arm of the bar almost doesn’t lean on the desk. You can also see in the image below that there are a lot of scratches here. Overall, I think this is a great product despite some minor issues in design. I’m using it for my daily life and I recommend it to your guys as well. FitDesk v2.0 is currently be sold on Amazon for $299. Don’t forget to drop your opinions about the product below. It is looking good. Can i have a try on it anywhere? So i can be able to decide either i want it or not?